The Historic Church of Historic Saint Patrick is one of Toledo’s most important and imaginative religious structures. Its history reaches as far back as the city’s beginnings and its founder is still respected for his efforts to improve the community. 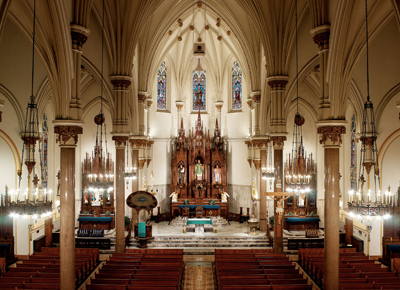 Father Edward Hannin was 36 years old when he was assigned to organize a parish in Toledo’s Irish Catholic population. It was a challenge, for in 1862 the city was busy constructing the Miami and Erie Canal and its laborers were more interested in saloons than churches. May 1862 Property on the corner of Lafayette and Thirteenth Streets purchased. July 4, 1862 Cornerstone of the church was laid. Feb 1, 1863 First service held in the church. Dimensions – 56′ x 125′ and built of brick. May 17, 1863 Dedication. With furnishings, organ, and bell, total cost approximately $27,000. By 1891 the church became unsafe. The parish hall, constructed in 1873-1874, was used as a temporary church to where all pews, altars and furnishings were moved. The old church was taken down. commenced and completed in November, 1892.
as it was for one entire year. July 15, 1894 Cornerstone laid. 1897 Woodwork for Gothic ceilings put in place. Dec 25, 1900 Church used for the first time. The ceiling is supported by 10 columns, cylindrical in form and made of soft red granite. Bases are octagonal with richly carved heads. Pure white marble forms the capitals. Sanctuary – life size figures represent Saint Ann, The Blessed Virgin, Our Savior, Saint Joseph, and Saint Joachim. Transepts – 14 x 40′ in size portray The Nativity and Saint Patrick and the Birth of Christianity in Ireland. Sides – Eight side windows depict the 12 Apostles and four Doctors of the Church. Gallery – Larger than life size figures depict King David playing the harp and Saint Cecelia playing the organ and looking toward the choir, giving musical inspiration. The sanctuary, side and gallery windows were donated by parishioners as were the columns. The Nativity in the right transept was donated by the Daughters of Mary. Saint Patrick and the Birth of Christianity was donated by the Ancient Order of Hibernians and its Ladies Auxiliary. All windows with the exception of the clerestory windows located high on the walls are stained glass. The clerestory windows are from the original church and are imitation stained glass. Main Altar – Saint Patrick, Saint Anthony (left), Saint Edward (right). Left Side Altars – Guardian Angel, Saint Agnes, Blessed Virgin, Saint Teresa of Avila. Right Side Altars – Saint Ignatius, Saint Joseph, Saint Benedict the Moor, The Child Jesus. Vestibule – Life size, the four Evangelists: Matthew, Mark, Luke, and John, donated by parishioners. — on the left lists men and women of the parish serving in World War I. — on the right lists window restoration benefactors. Extensive remodeling was done by Father Keyes during the 1920’s. New chandeliers replaced the old, and matching wall lights were installed. Marble on the altar floor and walls was added, and stations of the cross replaced station pictures. Terrazzo floor with shamrocks was laid and new altar furniture was added. In 1937, a new wooden cross sheathed in copper, covered with an outer layer of gold leaf and measuring 9′ x 14′ was placed on top of the spire. The morning of September 9, 1980, the steeple was struck by lightning resulting in a fire causing extensive damage which required removal of the remainder of the spire. In falling, the cross caused major damage to the roof.